From the journal of Captain Henry Thompson, January 13, 1814. Courtesy the Friends of Clifton. 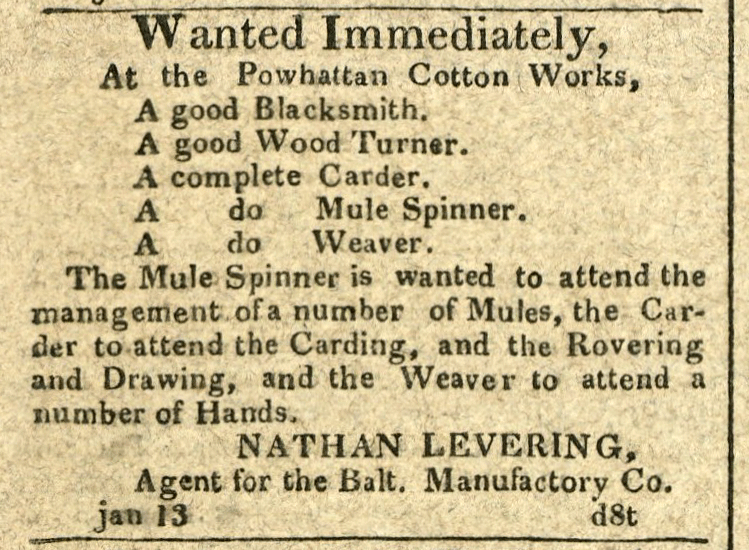 One of the earliest textile factories in Baltimore, the Powhatan Cotton Works was built by the Baltimore Manufacturing Company along the Gwynns Falls, six miles from the city and started production in 1811. 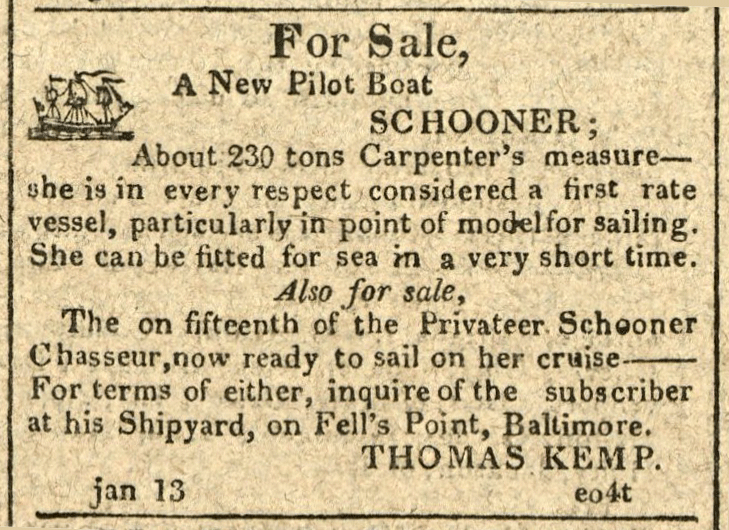 On January 13, 1814, Thomas Kemp advertised the “Privateer Schooner Chasseur” for sale and Captain William Wade prepared to take the ship out on its first cruise. Built by Thomas Kemp for local merchant William Hollins, the Chassuer launched on December 12, 1812 but failed miserably in two attempts to evade the British blockade of the Chesapeake on commercial ventures with the second trip ending in mutiny. Captain William Wade took command in February 1813 after the ship received a privateer commission and brought recent experience privateering as a second officer on the Comet under Captain Thomas Boyle. The Chasseur weighed almost twice as much as the Comet (resting in Puetro Rico after a damaging fight with the Hibernia just days earlier) and already had a reputation as one of the fastest top sail schooners built to date. Even with Wade’s experience and the ship’s speed, getting past the British might be a difficult task.